Yeah, I've never heard of the Online Film Critics Society either (hey, why aren't I in that?) but this news gives me an excuse to talk about something that's been banging around in my head for a few days. Basterds got a nod for Best Picture (competing against The Hurt Locker, A Serious Man, Up, and Up in the Air) and is up for a few others like Best Director and Best Supporting Actor. The Supporting nomination is for Christoph Waltz (Hans Landa) who deserves this award and a heck of a lot more. The man earned an Academy Award with the first scene he shot and everything after that merely piled on, no questions asked and no debate necessary. But was Basterds really the best picture of 2009? Well, that's hard to say. I haven't seen any of the other films it's up against and that's presuming that this list is definitive in some way when the entire endeavor is the very definition of subjective. There are undoubtedly good movies missing from the OFCS list just as there will be good films missing from the Oscars. Can't avoid that, really. So unless you're someone that's seen all these movies -- which is not me -- you're going to have to use your brain a little. 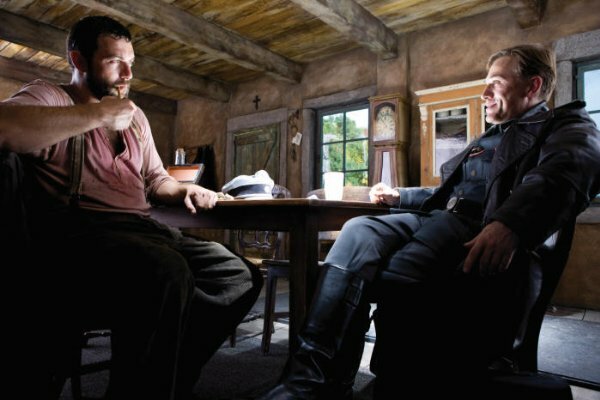 It's obvious to me that the performances and writing of Basterds probably isn't equaled in any of the other films at the same time. At best you're looking at comparing writing and acting performance against special effects, specter, and reputation (Avatar), and sheer entertainment (Up). The Cohen brothers don't seem to have reached critical mass this year with their writing but A Serious Man is going on my list no matter what, because I know there will be quality there. I've found this past week that at least one person who seemed personally offended that anyone would even consider Basterds for Best Picture, and also had a discernible distaste for drama all around. Where I saw masterful tension building upon tension in scenes that consisted of nothing but people talking to each other -- a ridiculously difficult technical accomplishment for a writer which is a big part of my point here -- he saw boredom. Where I saw a war being fought with words and deceit that could boil over any minute into real war (and does), he saw ten minute scenes that were "about ten minutes too long". That's a bit like someone who hates comedy appraising a comedy, complaining about there being too many jokes, isn't it? At some point you've got to take a step back and be completely honest with the world and just admit that drama isn't your cup of tea (or Tarantino films), and stop being offended when people want to hand out an award that typically goes to dramas, specifically to a movie that is a highly stylized drama from a director who indulges in style. If you have something against the man personally, you should probably stop being so stuck up. If you've got something against him professionally, then don't vote to give him Best Director, but holding a grudge for Best Picture is ludicrous. So I ask again, is Basterds the best film of 2009? Remember, we're not talking about most entertaining, or best performing at the box-office. It's probably better written than Avatar, based on the praise I've heard of that film -- which is thati's great but still a pretty well traveled story in general -- and perhaps better directed than A Serious Man and almost certainly better than The Hurt Locker. And some of the performances, like that of Waltz, can't be matched anywhere in cinema. My answer is yes. It'll get a nod, at least, so the only question in my mind is will enough people be able to get over the fact that Quentin Tarantino made this film in order to recognize its achievements. If they can, it'll probably win. You can see all the OFCS nominations on their blog.